Should navigation arrows function very differently depending on context? This one seems pretty fundamental to me — should the steering wheel ever control the gas? See one of Refinery29's slideshows. The arrows are the navigation: clicking right flips to the next slide and clicking left flips to the previous slide. That is, until you get to the last slide. Now there's a small tooltip when you hover over the right arrow that says "next slideshow." Now if you click the right arrow, you will be taken away from the current page and brought to a different page. Here's how it looks, tooltip says "next slideshow:"
Is it clearly a bad experience if navigational arrows are behaving so differently based on context? Is there any research I can reference? I could see an argument for this functionality if the next slideshow was somehow a narrative extension of the first, but this does not appear to be the case. Navigation exists to help users, not to be a puzzle in its own right. Users should be able to understand it immediately, and apply that understanding throughout the site. Sadly, lots of sites change their navigation features as users move around. Options come and go, making users feel a loss of control. How do I get that menu choice back? I saw it just a few pages ago. Non-standard GUI controls are a special case of the general problem of inconsistent design. Confusion results when applications use different words or commands for the same thing, or when they use the same word for multiple concepts in different parts of the application. Similarly, users are confused when things move around, violating display inertia. Using the same name for the same thing in the same place makes things easy. Remember the double-D rule: differences are difficult. Inconsistency Costs More Time than It Saves Deviate from the standard, and you'll easily cost users several minutes — or possibly hours — as they overlook or misuse UI elements. The time people spend pondering inconsistencies typically sums to much more than the small savings you'll hypothetically derive from a specialized design. I haven't seen such a treatment of a next button when on the last page. From a user's perspective, I would get very confused because when my eyes see that the last/next button is gray when I know it used to be black, my brain automatically thinks I have reached the end of a search result set or some sort of series. If I wanted to go to the next slide show, I want a list on the side bar of all available slideshows where the current slideshow is highlighted. This way, I can go to ANY slide show I want at any time, even if I'm only on page 3 of 8 in the current slide show. The way the above pagination UI is set up won't let the user know that there is another slide show until the last page. That's like telling me I have to go to the last page of a book to know whether there is a sequel or not. When I pick up something to read, I want to know whether it's a stand-alone, part of series, or is an issue that comes out periodically. Throughout my reading, part of my mind yearns "what more do you have?" 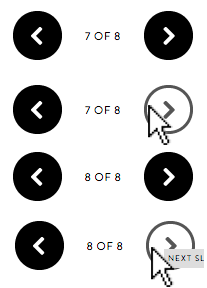 One question - how would the last page button be drawn if it were in the last slide show? In the example you provided, I don't think that there's an issue because the visual treatments are unique enough to create different implications. Also, they're using a system to create consistency: The big, black arrows are only used to change slides, whereas the smaller, white arrows on those red solid buttons are only used when changing to a new slideshow. Basically, I think that if you create a system for consistent visual treatments of those elements, the connotations will be clear. When I go through the slideshow clicking the arrow button, my attention is focused on the slide, not on the button. I may not notice that little tooltip that comes up at the end of the slideshow, and click the button without realizing its functionality changed. If you do accidentally go to the next slideshow, there is no way to go back. That is, the "go back" button takes you to the beginning of the previous slideshow, not to its end. Not the answer you're looking for? Browse other questions tagged navigation dark-patterns slideshow or ask your own question. On Android, how do you design a very shallow navigation? Is a navigation drawer preferred over a menu when menu items are not the main function? Should “Home” be in navigation? Should navigation clarity be sacrificed for length? Should the primary navigation link be duplicated in the secondary navigation?